Texas cuisine has become linked with several regional dishes – barbecue, chili, and Tex-Mex to name a few – but Texans love chicken fried steak so much that Oct. 26 has been Texas Chicken Fried Steak Day since a Dallas man successfully campaigned for the state holiday in 2011. To celebrate the upcoming holiday and learn more about why Southern comfort food remains popular, we spoke to Eric Justice, executive chef at East Texas-based Cotton Patch Cafe. 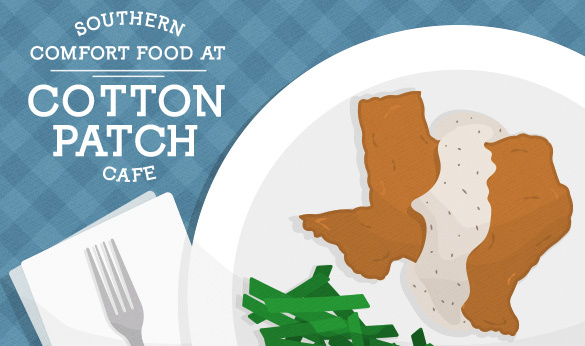 Cotton Patch Cafe’s first location opened in Nacogdoches, Texas, in 1989, but the restaurant has since brought its menu to more than 45 locations across the state and nine locations in nearby Arkansas, New Mexico, and Oklahoma. Customers flock to the restaurant for classic Southern comfort foods like macaroni and cheese, mashed potatoes, chicken and dumplings, and meatloaf, but the chicken fried steak – a cut of beef that is tenderized, seasoned with flour, fried, and paired with pan gravy – remains a customer favorite. It may be an indulgent meal now, but Justice explains that this “old school way of cooking a steak” was a necessity when it was invented way back when “cowboys” conjured images of men with hats and horses and not one of the state’s two NFL teams. Making chicken fried steak might sound simple, but Justice stresses the importance of each step in the process, from tenderizing the meat to the oil it’s fried in. Using the right seasoned flour is key to making a good chicken fried steak, but how the seasoned flour is applied also impacts the final product. Frying the steak is a “pretty straight forward” process, but chefs will end up with subpar results if it isn’t fried in fresh oil. Although chicken fried steak is a customer favorite, with an estimated one in three tables ordering it, the popularity of Cotton Patch Cafe’s other fried options led to the restaurant’s “Chicken Fried Road Trip” promotion. The annual promotion offers daily deals on spiced-up versions of the fried foods customers love as well as new items only available for a limited time. Those daily deals pair traditional menu items with new flavors, including maple, Nashville hot, and Buffalo glazes and jalapeno gravy made by infusing Cotton Patch’s standard pan gravy with roasted jalapenos. When it comes to offering new items or spicing up traditional favorites, Cotton Patch’s culinary team always keeps their customers’ expectations in mind. As a native Texan who grew up enjoying Southern comfort food, Justice understands what it is about those dishes that resonates with Cotton Patch Cafe’s customers. The restaurant does have lighter grilled options on the menu to appeal to diners seeking a lower-calorie meal, but most customers continue to choose Cotton Patch Cafe to indulge in the comfort foods they love.